Founders Aaron George and Michael Chasin have taken on one hell of a problem – dealing with lawyers. Just ask them about the pain. They were in law school together and found enough that dissatisfied them that they turned to their shared interest in entrepreneurship for careers instead of practicing law. Their collaboration has led to the creation of LawKick. LawKick is a marketplace for finding legal help online. The goal is to eliminate the inefficiencies that make access to legal help troublesome and help drive up costs. LawKick simplifies the process of finding a lawyer down to three easy steps. The service is free for users. Lawyers are vetted by LawKick before joining the platform, which, combined with reviews and resumes and prices for comparison, gives people the opportunity to find the right help at the right price quickly. Let’s be fair and say that lawyers provide necessary help, and that industry practices have sustained the perception of them all being villains while fostering incredible distrust. The LawKick platform encourages transparency and efficiency – and, we can hope, will lead to solving legal matters at lower costs. 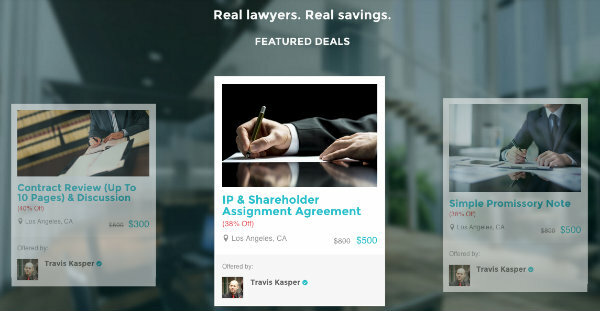 The site suggests savings of up to 75% for a lawyer’s services and reports that users receive their first price quotes within 18 minutes on average. LawKick also helps individuals find counsel for other concerns (we’ll stay positive and assume that these matters are usually separate from startup problems) – DUI defense, divorce, traffic citations, civil rights, real estate and more. So far, over 250 lawyers have joined LawKick in L.A., New York, San Francisco and Boston. Visit LawKick.com to learn more about the company, to find legal help, or offer legal services.